Artists have been incorporating the golden ratio in their work for many hundreds of years, and it is thought that when proportions are in line with this ratio, it tends to be more aesthetically pleasing. With that in mind, the clock that [Philippe] created must mathematically be the best looking clock we’ve ever featured, even if it is somewhat difficult to tell time from it. 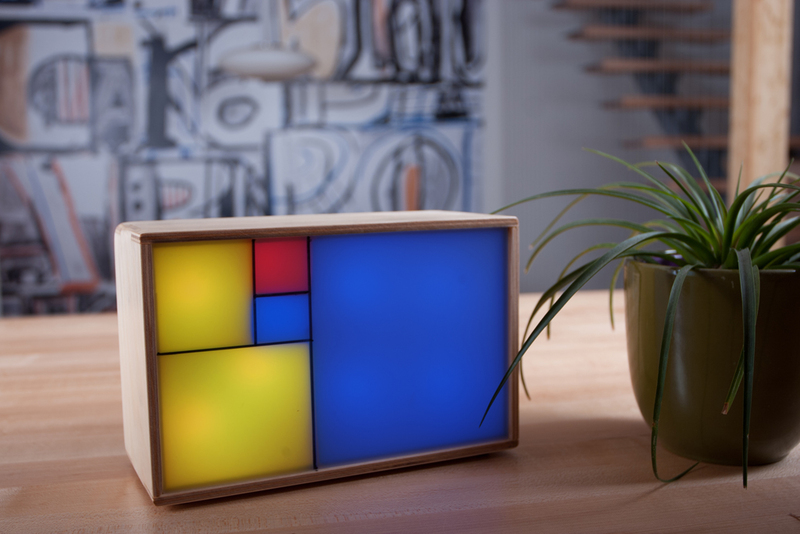 The clock is made up of squares which represent the first five numbers of the Fibonacci sequence. The squares are backlit with LEDs, which will illuminate red for the hour, green for the minute, and blue representing the overlap of hours and minutes. Simply add up the red and blue squares to get the hour, and add the green and blue squares to get the minutes. The minutes are displayed in 5 minute increments since there aren’t enough blocks though, so you’ll also have to multiply. Confused yet? If not, it turns out that there are several ways to display certain times using this method, any of which can be randomly selected by the clock. [Philippe] reports that there are 16 different ways to represent 6:30, for example. The clock is driven by an ATmega328P and is housed in a wooden case. There are schematics and code available on [Philippe]’s site if you want to build your own, there are detailed descriptions of how to tell time with this clock. You’ll probably need those. If you like getting confused by clocks, you might also like this one as well. Love it incredibly cool clock. Happy to see other crazy project ! I have my own fibonacci clock and metronome to display time, and beats. Am i the only one to notice no one took a piece of fruit from the counter? @Nathaniel : This one doesn’t tell time very well (or at all…) but it will definitely set the place off…. It uses the primary colors instead…. So 8:50 on the cover picture? Exactly 8:50 @Matthew! Well, 8:50 ± 0:05 :) Thank you all for your nice comments … it’s pretty exciting to be features here !!! Minor correction – the code is available, but the schematics won’t be until after the kickstarter items ship (according to the kickstarter page). Prrrrreeeeetttty neat. Looking forward to building one! After reading the article and understanding how to read it, it grew on me. This is one of the coolest clocks I’ve ever seen.